Actually these pads are not manufactured by Simmons, they come from the british drum pioneer Premier. They appear pairwise, joined by a wooden bridge with a drill hole to mount the pad pair e.g. on a cymbal stand. 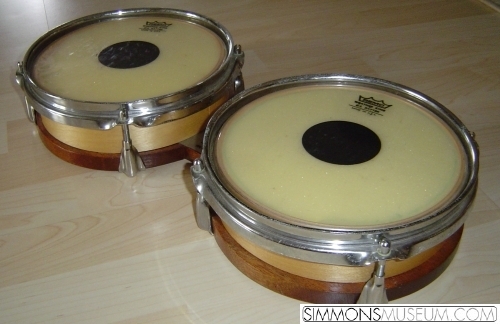 The pads are coated with real drumheads on the wooden body, tightened by 4 screws each hoop. The SDS 3 comes with two pairs of pads. One pair is the master and connected to the brain by a standard 5 pin midi cable. The slave pair is connected to the master by a stereo 6.3mm jack.